I finally got my garden planted yesterday. Finally. 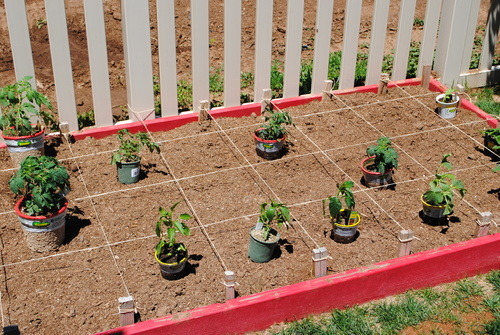 The weather up here in Midway, UT has been chilly, making it hard to get a garden up and growing. Hopefully the winter chill is behind us. Hopefully. This will be my second season having a garden and I am so excited to see it start to take off. If you would’ve asked me two years ago about gardening and more specifically, Square Foot Gardening I would’ve looked at you like a deer in headlights. But, with a little help from dear friends and google I was actually able make things grow. Believe me, no one was more shocked than I. 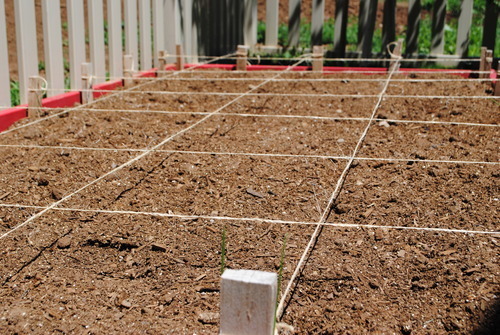 What was this Square Foot Gardening I kept hearing about? I learned that it doesn’t need as much water as a garden that is planted straight into the ground, it’s organized, no weeding required…wait, stop right there! I’m sold. To make the raised bed I followed The Pioneer Woman’s tutorial. I pretty much followed it to a T, with the exception of making my bed bigger and painting it red (I couldn’t help myself). I simply went to Home Depot, bought all the materials, painted the boards and then my husband built it. After asking around, I learned that an equal parts mixture of Vermiculite, Nutri-Mulch, and topsoil was the blend of choice to fill your bed with. I took the above picture yesterday after I had amended the soil a little and tied twine from stake to stake. All I did was incorporate a bag of Nutri-Mulch in to give it some pep since it has been sitting through a long winter (I did the equal parts mixture last year). I positioned my plant starts in the grids before I planted just to get a feel for things (I still need a few plant starts to fill empty grids). I chose to use starts instead of seeds. It was just my preference since I’m off to a late start this season. I have straightneck and crookneck squash, zuchinni (I can’t spell zoo-keeny for the life of me today), sugar snap peas, cucumbers, anaheim peppers, red and green bell peppers, roma tomatoes, grape tomatoes, sweet 100s, and another variety of tomato I can’t think of (your tomato plants will need cages for support as they grow). 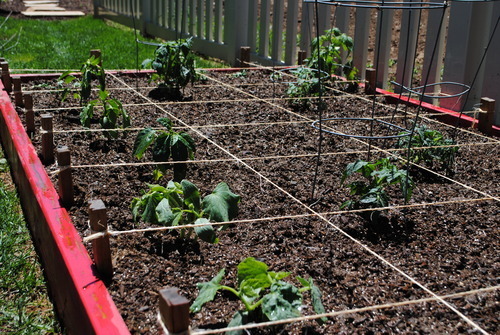 My only tid-bit is to plant your squash plants in a grid that is on the border and not in the middle. Squash plants get aggressively large, so it’s nice for them to be able to grow off the edge instead of into the middle where they could potentially choke out other plants. Planting is so easy. Just dig a hole the size of the dirt ball surrounding the roots of your plant. Place your start in the hole and back-fill. My friend Jen (she’s got a green thumb) showed me that if you mound up the dirt around the base (think of a volcano) of your plant, then create a trough like moat surrounding your mound it has created a perfect place for water to pool. This helps your roots grow deep and strong. Be sure and soak it well with water the first few days after planting. If I can do this, anyone can. I promise. Do you have a garden? What are some of your tips? What are your favorite things to plant? I’d love to hear.